Veranda® offers a handy composite baluster kit to match our deck railing products. 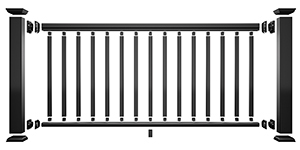 The kits include 5 – 35.25" balusters. Each baluster kit will cover 2 lineal feet of railing. It will take 3 kits to complete a 6' and 4 kits to complete an 8' railing section. Composite balusters are available in white, black and bronze.